Overlooked as a Padawan, he was to become one of the most revered Masters of all. Sworn to serve the Galactic Republic and the Jedi Order, his own apprentice would bring about their destruction. Powerless to retrieve Darth Vader from the dark side, he would train the only one who could. This is the legendary story of Obi-Wan Kenobi, from his first meeting with Anakin Skywalker to his final meeting with Darth Vader—and beyond . . .
﻿I really had a lot of fun reading this book. As I do just about anything related to Star Wars. The thing that really drew me into this book was the fact that it told the story that the movies didn’t. You know, the movies were actually good. *Cough, not the prequel trilogy, cough*. 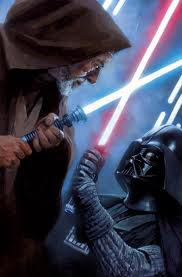 This book really got into the life of Obi-Wan, from the time he is thirteen years old, building his first lightsaber under the tutelage of Qui-Gon Jinn, to after he is killed at the hands of Darth Vader and when he is in Force-Spirit form. In the movies, all six of them, you see this British dude who can fight with a lightsaber and is apprentice, master, hermit, Jedi. And these are all great things, but pretty much all you see. Yeah, he’s in all six of the movies and yeah, you get to know his character. But, you can’t really see past the Jedi he was. In this book, you see the person that he was. This dude really did a lot of stuff when he wasn’t Jedi-ing. And that's really fascanating to me 'cause Star Wars is just kinda that way to me... I am the kind of person to imagine and... want all of this stuff to be real. I know, it's a six-year-old thing to say but it's the truth. All of this Expanded Universe stuff is just really cool to me. And I know I'm not alone with this (Hey, all you Star Wars nerds!) so that just makes it all that much cooler. I would really recommend this book to anyone who likes Star Wars. If you are into this kind of stuff, this is a must read. If you have ever visited the site Wookiepedia, you know what I'm talking about. So, if you know the nerdy part of life is superior to all others (I'm just saying that to make myself feel better) read this book. And enjoy it. Or I will eat your soul. Hey to all you people who read for fun. YOU ARE COOL. I so want a lightsaber but it has to light up and sound like in the movies! Have you seen the video Galactic Empire State of Mind? Take a look, it's very funny! BTW, I know what you mean about wanting it all to be real. I'm that way about LOTR. @*Jam* Haha, that's hilarious! I'm gonna be showing that video to all my Star Wars nerd friends.